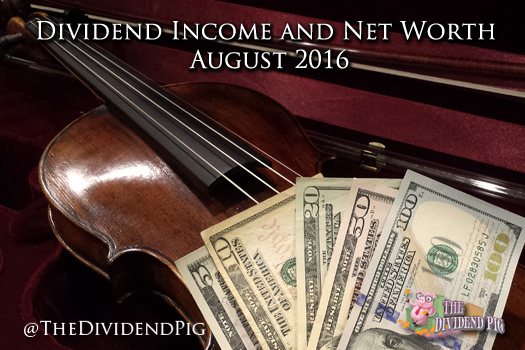 August’s dividend income was a crack over the fence home run! Unfortunately, net worth was more of a pop-up fly. You may have noticed this month’s report is a little late. I was traveling for work the last week and didn’t have access to my computer… which is one of the major reasons I want to retire early, so I can spend more time with my family. I am extremely happy to say we have another monthly dividend income record in the books. These monthly reports have been very helpful in not only keeping track of my progress but also keeping my motivation. Dividend growth investing is a very long term game with little instant gratification (other than the excitement of new buys). Even receiving monthly dividend payments has become somewhat mundane now. The one thing that has kept me eager and focused is my simple dividend income graph that shows the huge progress I’ve made over the last 2 years. If you aren’t keeping track of your monthly progress yet, do it now. This month I received $185.21 in dividend income. On average, I was paid $8.05 from 23 companies (specifically 22 companies and 1 fund). That would cover lunch out for every work day last month (of course, I wouldn’t eat lunch out, I pack my lunch)! This month’s dividend income is a HUGE 75.37% increase over August 2015. The pie chart below also shows the percentage of each payment . Cash has taken another big hit this month. We are in the process of renovations at our home that is eating up funds like crazy. As I mentioned, our home is undergoing, what I consider, some rather large renovations. The renovations are so big, we’ve been saving for them for several years to get them done and pay cash. I’ve also been doing a lot of the work myself, which is why these darn renovations are taking sooooooo long. Anyway, we dumped several thousand dollars into materials this month which is one of the reasons our cash position is down 6%. We also had a bit of lifestyle creep that’s wormed its way into our finances. You might notice that our collections jumped up 13% this month. Well, my wife AKA: Mrs. Sow (the proper term of an adult female pig [she doesn’t like this title at all]), needed a new violin. So we got her a fancy one, like $2,500 fancy. To be fair, violins are expensive after you get to a certain level. This one clearly sounded the best in our price range and had a cool story… it came straight from Germany and was made in 1813. Our property values have finally leveled off. I suspect our good friends at Zillow will soon start reporting the values down. I can’t imagine these prices staying this high for much longer. Well, that and we are pretty much done with the home buying season, so demand will drop. The rental properties are doing what they are supposed to do this month, make us money. We didn’t have a single problem with a unit this month, which is a nice change. We are still working hard on paying off rental property #2 mortgage. In fact, we have paid off almost $8,000 in principle this year. Our cars moved pretty much in line with what we expect. Our car values typically fall 1 – 2% each month. Dividend income is certainly going in the right direction. Sadly, I’m currently behind in my dividend goal to make $3,000 this year. It’s becoming more and more difficult to find decent values to make up for that deficit. Net worth is going to be pretty flat to down for the remainder of the year as real estate demand softens. If you’d like to see my previous dividend income and net worth updates, you can find them here. How did you do last month? Did you correctly forecast your dividend income for the year? Nice increase from last August! I find it difficult to find good values as well in this current market environment. I also like to buy for dividends and price appreciation. With that being said, I did buy two new stocks in August. Last month was also my best dividend month at $312.27. Keep the money churning and if you don’t make your $3,000 goal for the end of the year, hopefully you can make enough to pay for the violin! That’s a great way of looking at it! This years dividend income will easily surpass the cost of the violin. Congratulations on your huge month, that’s a great haul! Great work on the dividends. That’s a massive net worth! I want to buy many of the stocks you own. They should grow for a long time to come. As long as those dividends continue to roll in you’ll be fine. 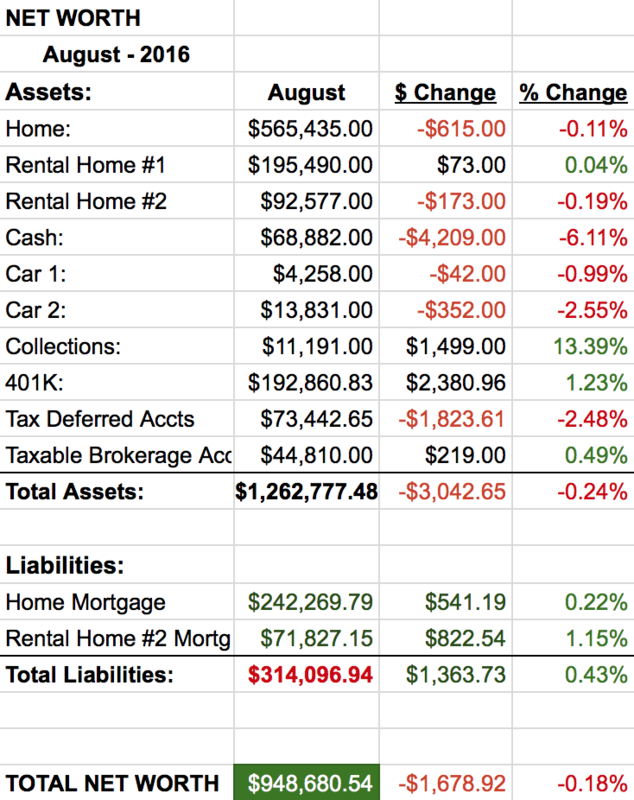 Net worth can change on a dime especially is your assets are in real estate or stocks. Dividend income tends to be more stable, reliable and predictable in terms of amount generated. Nice long list of payers for the month. Thanks for sharing. As always, thank you stopping by and the encouraging comments! Congrats on crushing your Y0Y dividend income. Seriously impressive gain. I am very happy with the growth. The only way it would be better is if I was making 75% starting at $1,000 instead of $100. But you gotta start somewhere. Thank you for the comment, always good to hear from you!